Sikkim Tourism Information - Tiny but beautiful, Sikkim is situated in the Eastern Himalayas, Spread below the Mount Kanchendzonga (8,534 mts. ), the third highest mountain peak in the world. It is one of the smallest state in India, with an area of 7,300 sq. kms. and measuring approximately 100 kms. from North to south and 60kms from East to West, the elevation ranges from 244 mts. - over 8,500 mts. above sea level. Sikkim is the richest treasure house of India’s Flora and Fauna. It is a landlocked state, bounded by Tibet in the North, Bhutan in the East, Nepal in the West and state of West Bengal in the south. Sikkim is the most peaceful land divided into four districts, which are known as East, West, North and South Sikkim. The river Teesta is the lifeline of Sikkim. Sikkim has many hot springs known for their therapeutic value. High in Sulphur content, the waters are believed to have great medicinal properties with the average temperature of the water in these hot springs close to 50 celcius. Sikkim’s only airport, located 4,600ft above sea level, is situated at Pakyong (PYG). Spicejet has flights to and from Kolkata (Calcutta - CCU). Though sometimes Flights to Bagdogra, so far the nearest airport to Sikkim, are considerably cheaper. The new airport fulfilling a dream that took long to take off but could be worth the wait for travellers used to making a 125 km road journey to Gangtok from Bagdogra airport or New Jalpaiguri railway station. The cheapest ticket on the Kolkata (CCU) - Pakyong sector has been fixed at Rs 2,600 under a central scheme to promote flights to smaller destinations. This price is restricted to about 25 per cent of the available seats. The subsidised seats are the first which are being sold out and what remains are only the premium tickets, SpiceJet officials and travel operators said. The airlines use 78-seater Bombardier Q400 series aircraft for flights. The Pakyong flight will take off at 9.30 am from Kolkata and arrive at 10.55 am. Gangtok is the Capital of Sikkim at an altitude of 1,600 mts. above sea level. There are many places of tourist interest in and around the city. You can move from the sub-tropical heat of the lower valley to the cold of rugged mountain slopes that reach up to areas of perpetual snow. Tsongo Lake at an altitude of 12,400 ft. is 34 kms from Gangtok and is regarded extremely scared. It is located on the old trade route to Tibet. Between may and August one can see a verity of flowers in bloom-the rhododendrons in various species of premulas, blue and yellow poppies, irises to name a few. It is also an ideal habitat for the red panda and various species of birds. The blooming nature in wild and the fresh snow makes this one-day trip a memorable experience. Yumthang, the famous valley of North Sikkim is situated at an altitude of 11,800 ft. embedded in confluence of Snow clad Mountains with meandering glacial stream and profusion of Rhododendrons. The most fascinating scene of this valley is the multicolored carpet of wild primulas, which spread far and wide on the plain. There is also highly curative hot spring. The route to Yumthang is Kaleidoscope of wild flowers and gorgeous waterfalls, which, one cannot afford to miss. 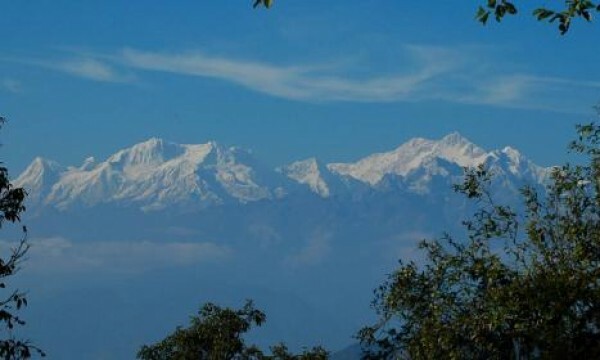 Pelling is situated in West Sikkim, which are 120 km. from Gangtok and 135 km. from Siliguri at an altitude of 2085 mts in sheer bliss for trekkers. Pelling is the closest motor-able viewpoint to Mount Kanchendzonga the Guardian Deity of Sikkim and third highest mountain peak in the world. One may see thirteen other snow-capped mountain peaks. 26 kms. drive on the Yuksam road one may visit the Khachoed Palri, the Wishing Lake. 30 kms. motor able distance from Pelling ends up in the first Capital of Sikkim-Yuksam. 2 kms. away from pelling is the Pemayanangtse Monastery. The wonder of the 17th Century Half an hour trek from here is the Rabdantse Palace, the ruins of second Capital of the Kingdom of Sikkim. An hours trek from Pelling, a steep trail from the South west extreme of foot ball ground will take to the second oldest Monastery of Sikkim the Saanga Choelling Monastery, the flags you see on the way are the ones that are offered by the people for their prosperity and happiness.